OPINION: ARE MARSHALL TAXPAYERS GETTING A FAIR DEAL ON THE EMERGENCY SERVICE DISTRICT CONTRACTS? Editor’s note: In the interest of full disclosure I must inform my readers that I do not live in Marshall. I live outside of Marshall in the county. I am a recipient of the Marshall taxpayer’s generosity and am appreciative of their actions. I am assuming that in typical form the City with do nothing to address this issue at the next meeting. It is for that reason that I offer heart warming thanks to the Marshall City Commissioners from those living in the county. In December 2017 the Marshall City Commission voted to enter into contracts with the Emergency Service District with one BIG understanding -- Mayor Hurta said that he would vote for the contract, but the City Commission would do a comprehensive review of the economic analysis of the contract in September 2018. Fire Chief Cooper agreed to provide that analysis prior to the September 2018 review. A video has been posted that documents the commitments of Mayor Hurta and Fire Chief Cooper. September 2018 has come and gone. I have been unable to find any information regarding the City Commission comprehensive discussion that Mayor Hurta committed to in December 2017. I have also been unable to find the comprehensive economic analysis that Fire Chief Cooper committed to during that same December 2017 meeting. It appears that the City Commission believes this item does not merit any discussion. What happened to the commitment Mayor Hurta made to a comprehensive review based on Chief Cooper’s economic analysis? I have included a spread sheet that identifies the issue. It appears to be the only analysis that has been made and it was not made by Mayor Hurta or Chief Cooper. 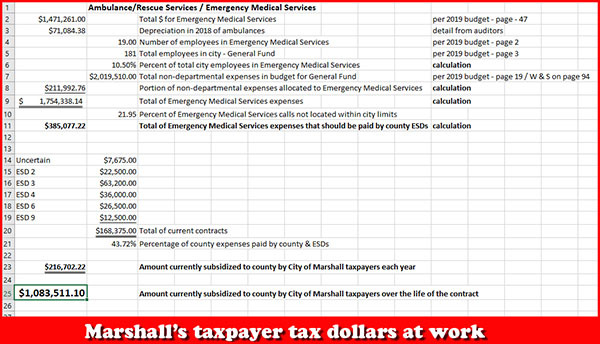 Based on these numbers it appears that Marshall taxpayers are going to subsidize the county more than $1 million dollars over the 5-years of the EDS contracts. I wonder why the Commissioners put this on the consent agenda and bypassed any discussion of these contracts?